A meeting between the presidents of Russia, Iran and Turkey on 7 September revealed a wide gulf between the three who had opted at the 2017 Astana Conference to monitor and enforce “de-escalation zones” in Syria. There was obvious bickering at last week’s summit, especially regarding the future of Idlib in northwest Syria, even though the summit’s final communiqué was positive and did not hint at any disputes. In a joint statement, the three presidents confirmed their “strong and continued commitment” to Syria’s sovereignty, independence, unity and territory, rejecting any attempts to “create new realities on the ground on the pretext of fighting terrorism”. They also declared their refusal of any separatist agendas in Syria that could undermine the security of neighbouring countries. The three agreed to address conditions in the de-escalation zone in Idlib in accordance with this spirit of cooperation. They committed themselves to eliminate the Islamic State (IS), Al-Nusra Front and other groups, and said that a distinction would be made between these groups and the armed opposition groups that had agreed to the ceasefire. The communiqué said it was impossible to resolve the Syrian conflict through a military solution, and that this could only be done through a political process. The three presidents said they intended to continue to push the political process forward based on decisions taken at the Russian-sponsored Sochi Conference and in UN Security Council Resolution 2254. The summit focused on the fate of Idlib, the last stronghold of the armed Syrian opposition, but ended without agreement despite what the communiqué implied. Turkey tried to enforce a permanent ceasefire in Idlib, but Russia and Iran insisted that the region must return to the control of the Syrian regime. Ankara said it wanted to avoid a massacre in Idlib. “If we can declare a ceasefire today, that would be a key achievement of this summit,” said Turkish President Recep Tayyip Erdogan. “Any attack on Idlib would result in a tremendous humanitarian tragedy. We cannot leave Idlib at the mercy of the Syrian regime whose massacres against its own people are still fresh in our memories,” he said. However, Moscow insisted that it would not end military operations without a victory against “terrorism” in favour of the regime led by Syrian President Bashar Al-Assad. Russian President Vladimir Putin refused a ceasefire in Idlib, saying that it was “unacceptable” to let terrorists withdraw to avoid being attacked and harm Syrian government forces. “The legitimate government in Syria has every right to take control of all its territory,” Putin said. Iran said it would not negotiate with anyone other than Al-Assad and that the groups defined as terrorist were not part of ceasefire efforts. The Russian tone sounded like a declaration of war, with Iran paving the way for an imminent attack on Idlib. Meanwhile, the regime and its allies are mobilising troops near Idlib in preparation for a final attack. However, Moscow cannot overlook Turkey’s interests, especially since the latter views the area as a national security zone and the first line of defence to protect Turkish territories from Kurdish separatists who want to create a Kurdish state in northern Syria. Turkey said it could isolate terrorist factions from others through precise military operations. Over the past three years, the Syrian regime, Russia and Iran have forced thousands of members of the opposition and their families from across Syria to gather in Idlib. The city is now home to three million Syrians, one third of whom are internally displaced due to reconciliation agreements, truces or settlements. This has transformed Idlib into a refugee area that could suffer a humanitarian tragedy if it is attacked. Russia and the regime are taking advantage of the fact that Hayat Tahrir Al-Sham (the Levant Liberation Organistion or HTS), which is affiliated with Al-Qaeda, controls most of Idlib and is rejected by most other armed opposition factions who will not enter into an alliance with HTS. The other opposition groups will not fight HTS because their greater goal is to defend the area from a possible military operation by the regime. Turkey has increased its military presence in and around Idlib, with 12 observation centres reinforced with heavy artillery. Meanwhile, the regime has carried out attacks with the support of Russian air strikes on several villages in the Idlib region. Idlib and its suburbs have seen ferocious air strikes by Russian fighters and regime helicopters dumping more than 50 barrel-bombs on residential areas. 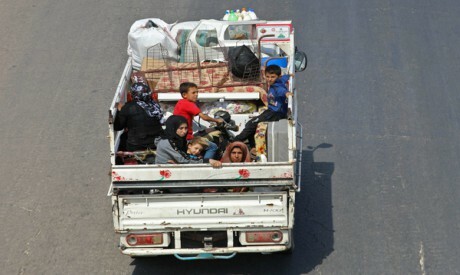 Turkey is not only concerned about protecting its first line of defence that shields its borders from separatist Kurds and Syrian regime forces, but it is also worried that a military attack on Idlib will result in tens of thousands of refugees fleeing to Turkey. This would cause an influx of refugees that Turkey could not handle since it already hosts three million Syrian refugees. The UN has warned of a “humanitarian disaster” if the regime, Russia and Iran attack Idlib, resulting in an estimated 800,000 more refugees. Moscow claims it has intelligence that jihadist fighters are planning chemical-weapons attacks in Idlib to justify a Western military intervention, accusing HTS and others of preparing for such a scenario and fabricating events that would accuse government forces of using poison gas against civilians. This would raise the ire of the West because there is intelligence confirming that the regime still possesses chemical weapons. The UN Security Council met one day after the three-way summit, but this came to very little. UN Special Envoy to Syria Staffan de Mistura focused on the need to open protected voluntary evacuation corridors for civilians from Idlib, which would mean facilitating displacement and demographic change under the pretext of war. He did not stress the need not to wage the attacks to begin with, or focus on the need to separate radical groups from other armed opposition groups. Days later, de Mistura invited representatives from Russia, Turkey and Iran to meet in Geneva to discuss the crisis, but these meetings also ended without agreement. HTS has taken control of large areas of Idlib, expelled other factions, and established what it calls a national-salvation government. Turkey is trying to contain the status quo by converting the group into a political movement, but this is a race against time as thousands of foreign elements in HTS are calling for combat. Idlib is a crossroads in the relationship between Turkey, Russia, Turkey and the US. Ankara agreed to be a guarantor of the de-escalation zones agreed at the Astana Conference, and it has also wanted to draw closer to Moscow after relations were left in tatters after Turkey shot down a Russian military jet. It might now break away from Russia and shift towards the US again, its decades-old strategic ally that seems more capable of defending its national security. All the sides are now mobilising around Idlib, including the regime, Iran, Russia, Turkey, the opposition fighters and Al-Qaeda affiliates. The US is monitoring the situation from bases a stone’s throw away in northern Syria and southern Turkey. Behind the scenes, the regime and Russia are bargaining with the armed factions and others in the city to put down their arms and withdraw in return for lucrative rewards. Idlib is no longer the concern of only the Syrians, as there are many influential international forces present, notably the US and Europe. What is certain is that there will be a humanitarian catastrophe if there is a war, with an unprecedented number of refugees and civilian victims.